A generation after heading the Human Genome Project, David J. Galas, Ph.D., established a research lab at the Keck Graduate Institute in Claremont, CA that focused on developing isothermal technology for amplifying nucleic acids as an alternative to PCR. He also founded a spinout company focused on commercializing the resulting assays. The Keck spinout, Ionian Technologies, succeeded more than a decade ago in achieving detection of infectious diseases within minutes through rapid amplification of small samples of short DNA or RNA fragments. The technology attracted the interest of Alere, which acquired Ionian in 2010 and began commercializing the assays four years later. Today, Galas represents roughly three dozen former Ionian shareholders who have spent nearly two years waging a legal battle to secure $30 million in milestone payments they contend are owed to them by Alere and its successor company, Abbott. The case is pending in Superior Court of California, County of San Diego, where it is headed for trial in June, after Alere tried, but failed, to have it dismissed. Alere has argued that the Ionian shareholders had not fulfilled the terms of the companies’ merger agreement, and has accused Galas of breaching the accord—contentions that Galas denied in an interview. At the center of the legal dispute is the Ionian-developed isothermal technology, which was designed to deliver rapid detection of infectious diseases through quick amplification of small samples of short DNA or RNA fragments. The isothermal tech was developed by Ionian researchers who earlier worked for Galas’ lab at Keck. The team noted that their isothermal reactions for amplifying DNA offered advantages over rolling-circle amplification and especially the much more widely used PCR: namely, no more need for a temperature cycling protocol to achieve amplification—which effectively limited the rate of amplification to the temperature cycling schedule—and the ability to achieve amplification above the maximum two-fold amplification achievable in each cycle. 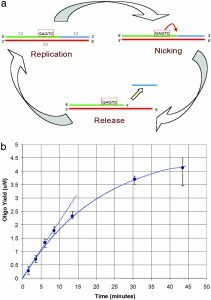 “The robustness, speed, and sensitivity of the exponential reaction suggest it will be useful in rapidly detecting the presence of small amounts of a specific DNA sequence in a sample, and a range of other applications, including many currently making use of the PCR,” Galas and colleagues concluded. Also in 2003, Galas secured a $489,000 grant from the Defense Advanced Research Projects Agency (DARPA) to develop the rapid-detection technology, then known as the Handheld Isothermal Silver Standard Sensor. The technology has since been applied in a line of CLIA-waived, marketed diagnostics designed to detect influenza A and B, respiratory syncytial virus (RSV), and strep A. Alere gained control of the technology when its predecessor company, Inverness Medical Innovations, acquired Ionian in 2010. “We had talked to a couple of other companies,” Galas said. “But Ionian was an extremely small company, and we as a board understood is that if we wanted to actually create FDA-approved products, we were going to have to develop a clinical group and so forth. That would have been growing the company substantially more, which would have required substantial investment. “It seemed like a nice opportunity to get quickly into diagnostics and to also get a yield to the investors,” Galas added. Alere commercialized the technology through a line of diagnostics it marketed under the name Alere I, starting with the influenza A and B test, which was initially launched in Europe in 2014. 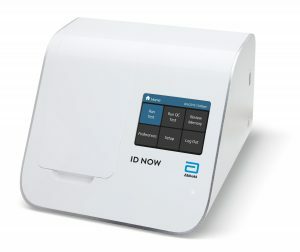 Abbott’s ID NOW is a line of CLIAwaived, marketed diagnostics designed to detect influenza A and B, respiratory syncytial virus (RSV), and strep A.
Alere was acquired by Abbott in 2017 for approximately $4.5 billion, following more than a year of legal wrangling after Abbott attempted to end the deal. Since then, Abbott has rebranded the test as ID NOW, part of the Rapid Diagnostics business of Abbott’s Diagnostics segment, which finished 2018 with sales of $2.072 billion. Alere, and its successor company Abbott, have refused to pay the $30 million in milestone payments to Galas and other Ionian shareholders. They took Alere to court in May 2017, five months before Abbott completed the acquisition, contending that Alere breached its 2010 agreement to acquire Ionian. Abbott representatives at deadline had not responded to queries from Clinical OMICs about the case. (a) The cycle of the synthesis and release of the amplified oligonucleotide is shown schematically. On the upper strand is indicated the recognition site for the enzyme N BstNB (5′-GAGTC-3′) and the specific nicking site four bases downstream on this strand. The oligonucleotide produced is indicated in blue, the primer in green, and the template in red. The lengths of the template and amplified oligo are shown (upper left). (b) The results of a linear amplification reaction where the primer template produces a 12 mer as the full-length product. The primer template was present at 1 μM in a 50-μl reaction (see Materials and Methods), and the yield of the reaction products is shown. The duplex used a top strand (ITAtop) of 16 nucleotides and a bottom strand (NBbt12) of 28 nucleotides that produced a 12 mer. Alere responded legally in a cross-complaint filed in October 2018, accusing Galas and Ionian’s onetime CEO Andrew P. Miller, Ph.D., founder and CEO of NAT Diagnostics, of breaching Alere’s merger agreement with Ionian. 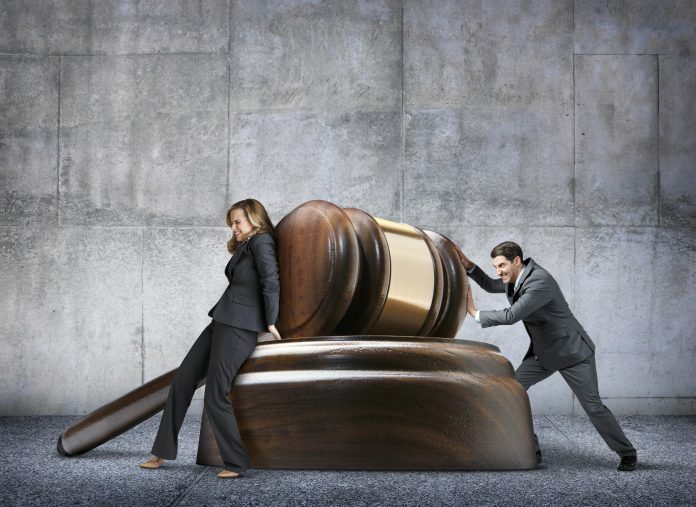 Alere also accused both men and NAT of unjust enrichment and breaches of California’s Uniform Trade Secret Act and Unfair Competition Law, while accusing Miller of breaching a severance pay agreement and fraudulent inducement. Alere asserted that NAT misappropriated Ionian’s nucleic acid amplification technologies for its own diagnostic tests. Alere cited Galas’ role as a director of NAT, which has been disclosed in filings with the U.S. Securities and Exchange Commission, and also asserted that the two men were in “regular contact” and that Galas was an investor in NAT. Galas insists the agreement was not breached, and that no wrongdoing against Alere and successor Abbott has occurred. In December, California Superior Court Judge Joel R. Wohlfeil denied a motion by Alere for summary judgment, ruling that the wording of the agreement by which Alere bought Ionian was vague enough to allow consideration of “parol” (also called “parole”) evidence beyond the text of the contract. “The contract language is ambiguous and subject to more than one reasonable interpretation. As a result, parole evidence is admissible, and there remains a factual dispute,” Judge Wohlfeil wrote. Galas and the Ionian shareholders contended in court papers that Alere wrongfully never paid the two $15 million payments even though the company commercialized tests based on the Ionian-developed technology and obtained three U.S. patents based on Application No. 11/778,018, all of which have at least one claim substantially similar to claim 67. The merger agreement was amended twice; the second amendment in 2015 added a $5 million milestone payment tied to achieving commercialization of the RSV test. Galas and the Ionian shareholders assert that Alere wrongfully delayed payment since it was not made until May 2017. For that milestone and the two larger ones, Alere has countered that Galas and the Ionian shareholders failed to meet conditions, arguing that the claims in the issued patents were not substantially similar to those of Application No. 11/778,018, and were not allowed or issued by the agreement’s target date of January 12, 2017 since the ‘263 and ‘264 patents were issued on February 7 of that year. Galas and shareholders said they agreed to the target date based on Alere making best efforts to secure allowance of the claims. They have accused the company of foot-dragging, while Alere has denied wrongdoing.